Custom Post Type for Photos — Statua takes full advantage of the new custom post type functionality than came with WordPress 3.0, so adding photos and galleries is dead easy! Alternative Layouts — Statua currently includes 3 alternative layouts which you can set as your homepage or use as a page template. Each layout has its own set of options in the options panel. Custom Typography — You can customize the typography in the theme to suit, and there is full support for Google Fonts in the font selector. Custom Widgets — Statua free theme has 1 sidebar and up to 4 footer widgetized areas, and as always comes with custom Woo Widgets (ad space, blog author, WooTabs, subscribe, feedback, search, embed/video, Flickr, and Twitter). Alternative Styles — The theme includes 8 alternative color styles which you can preview in the demo, and also has styling options for background color/image and setting link and button color. Sidebar Manager — Statua’s sidebar manager allows you to replace all widgetized sidebars and footers in WooThemes’ layouts with unique custom sidebars. Custom Shortcodes — All of WooThemes’ templates include custom shortcodes that allow you to easily add buttons, boxes, social buttons, columns, and more to your posts, pages, and widgets! Custom Navigation — Woo Custom Navigation has officially become part of the WordPress core. 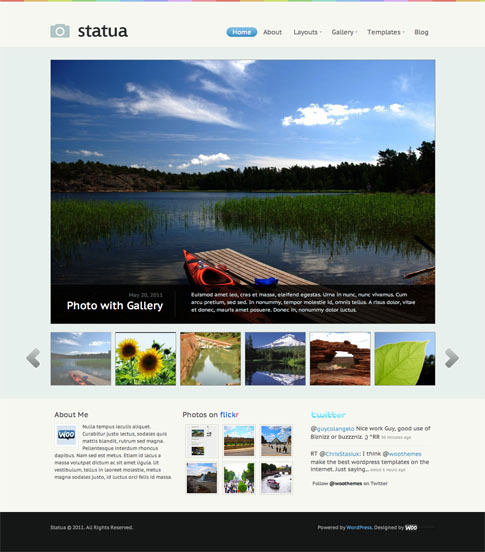 WP Menus allows you to customize the themes navigation to include pages, categories, and custom links. Built-in SEO Options — Every template developed by WooThemes now includes SEO options to help propel your site’s search engine ranking. Come back and check out the showcase as we find more sites from around the web using Statua.